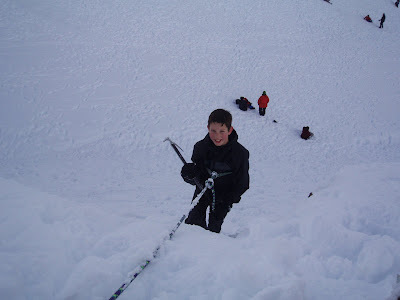 The is one of the students from Cust learning the snowcraft skills of walking in snow and using an iceaxe. The rope is 'belayed' on an italian hitch to a deadman(anchor), as the snow compactability was zero. The rope was more of a raise than a belay, and considered a third point of contact(first two being feet and axe). Also note the run off slope.The children enjoyed their visit to Temple basin.